" Whatever you do, in thought, word, or deed, do it all for the glory of God." While none of the members of the Continental Congress was actually tried for treason, fifteen who signed the Declaration of Independence had their homes destroyed, four were taken captive, and one spent the winter of 1776 in the woods, pursued by British soldiers who had burned his home. Before the end of the Revolutionary War, many of those who served in the Continental Congress suffered direct, personal consequences for their support of American liberty and independence. "When the last dutiful & humble petition from Congress received no other Answer than declaring us Rebels, and out of the King’s protection, I from that Moment look’d forward to a Revolution & Independence, as the only means of Salvation; and will risque the last Penny of my Fortune, & the last Drop of my Blood upon the Issue. " The Rotunda for the Charters of Freedom is the permanent home of the Declaration of Independence, Constitution of the United States, and Bill of Rights. These three documents, known collectively as the Charters of Freedom, have secured the rights of the American people for more than two and a quarter centuries. The Declaration announced to the world on July 4, 1776, that thirteen British colonies in North America were leaving Great Britain to form a separate nation, called the United States of America. In justifying the revolution, the Declaration asserted a universal truth about human rights. The Constitution, drafted in 1787 after a hard-won victory in the War for Independence, codified the spirit of the Revolution into an ingenious practical scheme of government to promote the welfare of all its citizens. One Country, One Constitution, One Destiny." PROGRESSIVISM AND THE ADMINISTRATIVE STATE WOW!!! Hillsdale College currently offers two free online courses and one mini-course on the U.S. Constitution. Each course contains weekly lectures, study guides, quizzes, readings, and Q&A sessions featuring participant questions. Sign in or create an account to save your favorite documents, study resources, and recently viewed items. This is a five-part introductory lecture series by Hillsdale College President Larry P. Arnn focusing on the Constitution of the United States. Taught by the Hillsdale College Politics faculty, this course will introduce you to the meaning and history of the United States Constitution. The course will examine a number of original source documents from the Founding period, including especially the Declaration of Independence and The Federalist Papers. The course will also consider two significant challenges to the Founders’ Constitution: the institution of slavery and the rise of Progressivism. This is a free, ten-week, not-for-credit online course offered by Hillsdale College. With introductory and concluding lectures by Hillsdale College President Larry P. Arnn, the nine lectures—taught by members of Hillsdale College's politics department faculty—are a continuation of Constitution 101 (2012): The Meaning & History of the Constitution. These lectures will focus on the importance of the principles of the American Founding and the current assualt on them by the Progressives. This free, 10-week, not-for-credit course, taught by the Hillsdale College politics faculty, will help you understand the structure and function of executive power in the American constitutional order. The course begins with the place of the president in the constitutionalism of the Founding Fathers and examines how that role has changed with the rise of the modern Progressive administrative state. Weekly series featuring Hillsdale President Larry Arnn, national radio host Hugh Hewitt, and members of the Hillsdale College faculty. Hillsdale College's Allan P. Kirby, Jr. Center for Constitutional Studies and Citizenship in Washington, D.C.
Geography Library (6) view unit Excellent! Step Three: Who You Gonna Call? If your students lack experience in dealing with primary sources, you might use one or more preliminary exercises to help them develop these skills. Digital Classroom of the National Archives, which features a set of Document Analysis Worksheets. History Matters offers pages on "Making Sense of Maps" and "Making Sense of Oral History"
George Washington - "The Constitution is the guide which I will never abandon." Benjamin Franklin - "Tell me and I forget. Teach me and I remember. Involve me and I learn." Thomas Jefferson - "It is every Americans right and obligation to read and interpret the Constitution for himself (or herself)." Abraham Lincoln - "Don't interfere with anything in the Constitution. That must be maintained, for it is the only safeguard of our liberties." John Adams - "You will never know how much it has cost my generation to preserve your freedom. I hope you will make good use of it." since the days of Noah until now. The birthday of a new world is at hand. Outline and Rewrite the Declaration of Independence in your own words. Memorize the first two paragraphs of the Declaration of Independence. Helpful for Research: For an excellent and helpful breakdown, in simple language, of the charges/grievances contained in the Declaration of Independence, see Was the Revolution Justified?, on EDSITEment-reviewed The Gilder Lehrman Institute of American History. Annotate your copy of the Articles of Confederation. How did the articles set a precedent U.S. government? Can you see any elements of them in U.S. government today? The United States has operated under two constitutions. The first, The Articles of Confederation, was in effect from March 1, 1781, when Maryland ratified it. The second, The Constitution, replaced the Articles when it was ratified by New Hampshire on June 21, 1788. What is the significance of the Six Big Ideas in the Constitution historically and for Americans today? Research A More Perfect Union: The history behind the Constitution. Now you are ready for Big Ideas! Does the map suggest hypotheses about the relative importance to the Founders of the powers of the new government? To what extent do the powers of each branch of government displayed in the map match how the federal government works today? Does the word count make a significant statement about value of content? Can few words used wisely be as powerful and persuasive as many words? Can you form a valid hypothesis about relative importance of ideas by word count? Annotate your copy of the Constitution. Compare and contrast the Articles with the Constitution. Works Cited: Mount, Steve. "Constitutional Topic: Comparing the Articles and the Constitution." USConstitution.net. 26 Sept. 2015 . Answers: Do Not Peek -- Do your own work! Legislative branch-- makes the law. Executive branch-- executes the law. Judicial branch --interprets the law. men who pervert the Constitution." "Supporters of the Compromise of 1850 lauded it as a continuation of the Missouri Compromise, which had helped maintain peace for thirty years. But four years later, the Missouri Compromise was eviscerated by the Kansas-Nebraska Act. Authored by Democratic Senator Stephen Douglas, it was in fact two provisions, one providing for the territory of Nebraska and the other for the new territory of Kansas. Breaking with the Missouri Compromise’s ban on slavery in this part of the country, it established the policy of “popular sovereignty”: Slavery would be voted on by the citizens of each territory, and made legal or illegal according to the will of the majority. For Lincoln, this policy struck at the very heart of free government." Congress Creates the Bill of Rights consists of three elements: an eBook, a mobile app for tablets, and online resources for teachers and students. Each provides a distinct way of exploring how the First Congress proposed amendments to the Constitution in 1789. The eBook is available for download on your computer and available in iTunes and the iBookstore for your iPad, iPhone, and iPod Touch. The online resources available for teachers and students present questions, lesson ideas, and supporting resources selected to facilitate learning with the app and eBook. Why was a Bill of Rights needed in 1789? What was James Madison’s role in creating it? The Constitution Glossary: The Glossary. What was the purpose the featured document? What is the historical significance of the featured document? What insight does the Senate Mark Up lend into the time when it was created? Use Worksheet 5 to translate at least 3 amendment(s) of your choice as passed by the House into an 8-12 word "tweet." Which proposed amendments were present from the state conventions to the Bill of Rights as ratified by the states? Which ideas from state conventions were not present in the final Bill of Rights? Do not start until you have successfully completed Activities 1-4. Use your research to form your opinion about these questions. Form a thesis sentence and write a formal paper based on your learning. Do you have original questions that you would like to pursue? Great! I will also grade your notebook work (worksheets, timeline, and independent study) and oral participation. Use all your "Lost Tools" to do your best work. Many feel that without James Madison's leadership there would have been no Bill of Rights. At the same time, the Bill of Rights that was created was not exactly what Madison had originally proposed. Anti-Federalist leader Aedanus Burke (SC) dismissed James Madison's proposed amendments as "little better than whip syllabub, frothy, full of wind, formed only to please the palate." Why might an Anti-Federalist have expressed this opinion? Did his assessment have some validity? Why or Why not? Following the suggestion of Roger Sherman, Congress decided to attach the Bill of Rights to the end of the Constitution rather than accepting James Madison's approach to change the text of the document itself. How might the Constitution and Bill of Rights have been affected by following Madison's approach instead of Sherman's? Whose ideas do you support? Why or why not? Creating the Bill of Rights was one of the early accomplishments that demonstrated that the First Congress could serve as a forum to resolve important national issues. How did the legislative process by which each amendment was considered bring different points of view to bear upon the amendments and allow different voices to shape each of them? Are there weaknesses in this method? Do you think this process is valuable? Why? Can you think of ways to improve this process? but we,the whole people, who formed this Union. To download an e-book copy of Ashbrook’s 50 Core American Documents, click here. The following is a list of letters, speeches, documents, web sites, books, and articles on significant people and events in American political thought and history. Rather than being a comprehensive list of available resources, it is meant to be a list of the best resources available on the given subject. Four lesson plans ﻿﻿have been created to align with the content the Constitutional Convention as a Four Act Drama. Use the Web to learn more about the founding of the United States and the freedoms provided by the United States Constitution. 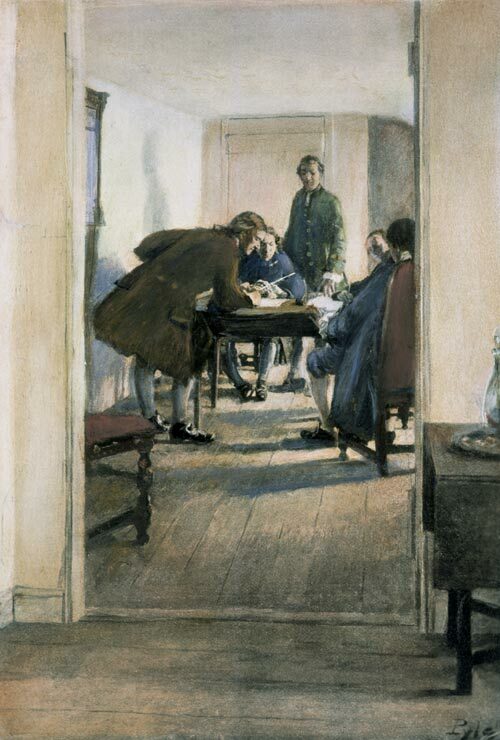 This lesson uses primary sources documents related to teach students how the First Congress created the Bill of Rights, and about the essential role James Madison played in that process. Teaching Six Big Ideas in the Constitution (used above) This lesson engages students in a study of the U.S. Constitution and the significance of six big ideas contained in it: limited government; republicanism; checks and balances; federalism; separation of powers; and popular sovereignty. This lesson will explore the implementation of the war-making power from the first declared war under the Constitution—the War of 1812—to the Iraq War. Students will examine primary sources from the historical records of Congress to analyze the reasons in support of and opposed to going to war against Great Britain in 1812. Students will consider what is worth fighting for and who, under the constitutional separation of powers, should decide questions of war. In this lesson students will examine several historical congressional records from the Reconstruction era to determine whether the Reconstruction period of American history should or should not be viewed as a revolution. Students will explore records from the U.S. House of Representatives to discover the story of Harriet Tubman’s Civil War service to the government and her petition to Congress for compensation. In this lesson students will use facsimiles of historical records of Congress to investigate whether the frontier shaped America or if America—through Congress—shaped the Western frontier of the contiguous 48 states from 1789 – 1890. This lesson uses historical records from the House Committee on the Judiciary to explore the constitutional issues that the committee encountered as it deliberated the Voting Rights Act of 1965. This lesson uses historical records of Congress to illustrate the veto and veto override process. This lesson uses historical records of Congress to explain the process of a bill becoming a law. Students learn the concepts of representation, separation of powers, and the constitutional role of Congress. This site has a host of activities and information for middle school and high school students. Excellent site for projects or individual study as well. This site has a long list of great topics and activities to tap into for classroom study and fun. Great for all ages but especially middle school and high school. Provides a comprehensive history of the Constitution and a detailed summary of the document’s main points. Contains games (both print and interactive), glossary, links to US Government sites, etc. Excellent resource! Features complete transcript of the Constitution and links to resources which describe its formation. Section with bios on all the signers. Excellent site for extra credit work. This site lists topics or ideas commonly believed to be addressed as part of the Constitution but in fact are not. Information about these topics tells where to find the topic or issue in other documents. Excellent for class discussion. Lots of facts, games, puzzles and interesting information. Tim and Moby unpack the meaning behind the U.S. Constitution. Teaches the founding fathers’ plan for the government and the seven principles on which the Constitution is based. America's journey through slavery is presented in four parts. For each era, you'll find a historical Narrative, a Resource Bank of images, documents, stories, biographies, and commentaries, and a Teacher's Guide for using the content of the Web site and television series in U.S. history courses. Link to additional Web sites to research major events in American history and the founding of our nation. Provides teachers with a full range of resources and activities to support the teaching of landmark Supreme Court cases, helping students explore the key issues of each case. The "Resources" section features basic building blocks such as background summaries and excerpts of opinions that can be used in multiple ways. The "Activities" section contains a range of short activities and in-depth lessons that can be completed with students. The Web site features key cases mandated by state standards. This site features links for students and teachers to learn about the American Revolution. There are excellent graphics on this site. Learn about the factors that inspired American rebellion against the British crown. There is also information about the Stamp Act, the Boston Tea Party, loyalists, and British officials in the colonies. This site provides online access to historical U.S. documents. The documents span a variety of topics, such as economic, demographic, legislative and legal, and regulatory issues, and include papers from the office of the president. The Charters of Freedom pages at the National Archives and Records Administration offers high resolution versions of the original documents and transcriptions of each document. Includes topics related to the founding documents, search capabilities within the documents, timelines, glossaries, and information on the framers of the documents. Explore the history of the suffrage movement online. Links include a chronological time line of events leading up to women's right to vote and a bibliography of the suffrage movement. Read about the important individuals and accomplishments in the women's rights movement in the last 50 years. The Library of Congress's African American Mosaic exhibit. Read about the development of the abolitionist movement, prominent members of the movement, and the many publications that dealt with slavery. This site profiles Rosa Parks as one the 100 most important people of the 20th century. Find out what gave Parks the courage to challenge the constitutionality of segregation and how her actions impacted the civil rights movement. This site presents a summary of House operations, including the proposed schedule for the week and coverage of up-to-date events on the House floor. It also provides access to information about bills and resolutions being considered in Congress, a searchable archive, and an opportunity to write to representatives. Features on this site include a link called This Week in History and a link to Senate art. You can track the legislative activities of the Senate or find out how to contact your senators. This site includes an informative link to the current president and vice president, an Interactive Citizens' Handbook, information about White House history and tours, a virtual library, and much more. This site provides online access to historical U.S. documents, timelines, and online exhibition gallery tours. This site includes information on past cases and present decisions. Features on this site include information on American history and culture. Explore biographies, politics, religion, and special exhibitions. Since the advent of civilization, humans have had an impulse to form governments. It is an experiment thousands of years in the making. What types of governments are there? What is a democracy? Where is the center of governmental power? Is it national or local? Is America's government too big? Too small? Constantly shifting with the times? What are the rights and responsibilities of each American citizen? Federal-State Relations Today: Back to States' Rights? What Factors Shape Political Attitudes? How Do Citizens Connect With Their Government? The Presidency: The Leadership Branch? State and Local Governments: Democracy at Work? What Are Politics and Government? We the People: Getting to Know Your Constitution by Homeschool Legacy.